Address: Bulgaria, Primorsko, 2 Fregata str. 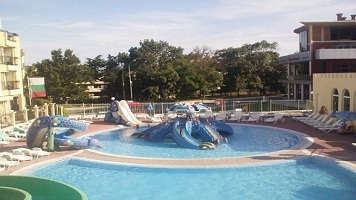 AQUA PLANET is a modern amusement aqua park, located in the resort Primorsko, south of Burgas. The park is situated in the middle of a big sports complex, offering a wide variety of opportunities for active sports. There are two large swimming pools with artificial wave generation system. 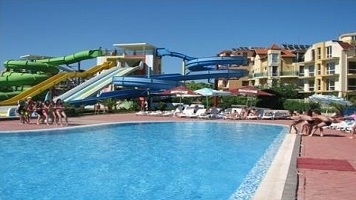 For the youngest visitors the aqua park offers children's pool and a big artificial river. The territory of the aqua park also comprises a multi-purpose indoor sports hall with 1 000 seats, suitable for contests and training of different clubs and federations of handball, volleyball, basketball and aerobics. There is also a congress center, adjacent to the hall, with conference room. The Sports Centre of waterpark "Planet" offers tennis court and tennis equipment.